Happy First Anniversary Mr. and Mrs. Maglaya! My sister and brother-in-law are celebrating their first wedding anniversary tomorrow. My sister, who is a year older than me, called us up today to inform us of a swimming party for the family tomorrow at the village clubhouse in my parents' village. I was half-glad that they thought of celebrating this milestone with the whole family. On the other hand, I would also understand if they set off to some place private. My sister and brother-in-law has been together since we were in college. I was so elated when they finally decided to get married that I even got myself involved in the preparations for the wedding. 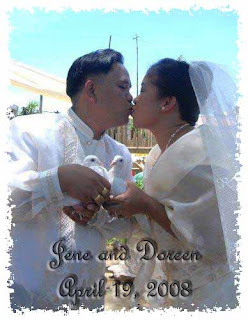 On their special day, I am wishing for more happiness and marital bliss. I also pray that God will guide them every single day like how He did in our marriage. I wish for them to have more financial blessings for them to start investing on assets and investments like health and life insurance policies. (Go ahead brokers, give them your free insurance quotes NOW, hahaha!) Lastly, I am praying for a neice or a nephew from the two of them. So far, the only babies in their home are four-legged creatures with tails! Seriously, I wish them all the best! Bebs and Uj, welcome to your second year!